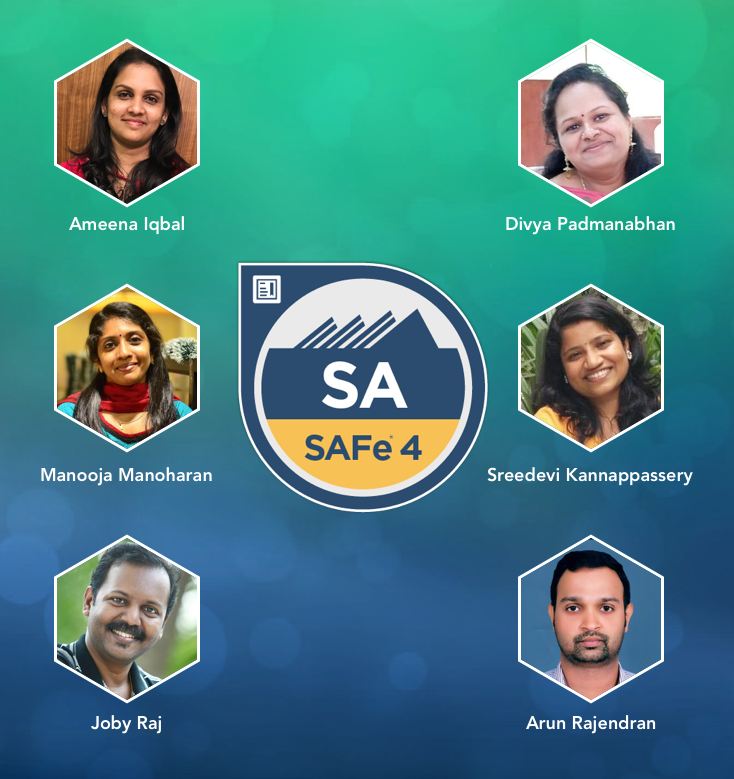 Kudos to Ameena Iqbal, Divya Padmanabhan, Manooja Manoharan, Sreedevi Kannappassery, Joby Raj, and Arun Rajendran who certified as SAFe Agilists. The six QBurstians successfully completed the Leading SAFe training with SAFe Agilist certification from Scaled Agile Community. The SAFe 4.5 training, conducted by Temenos+Agility in July, was the first ever to be held in India. “Agile has always been the QBurst mantra for software development. As we work with enterprise clients, it is imperative that we scale our Scrum teams. SAFe is a way to scale Agile and meet the demands of large projects,” reflects SAFe Agilist, Manooja, who is a senior project manager at QBurst. SAFe, short for Scaled Agile Framework, is a framework for enterprise agility that combines the concepts of Lean, Kanban, Scrum, and Extreme Programing. Currently, in its fourth iteration, SAFe 4.5 reflects the latest in Lean-Agile thinking. Leading SAFe trainings aim at instilling the principles and practices of SAFe in attendees.